Using the latest microwave technology at the same time both the density and moisture can be measured without contact to the product. Due to the robust and modular design the microwave measuring instrument HK9 is particularly suitable for the measurements of moisture and density at bulk cargo and bale on a conveyor belt. 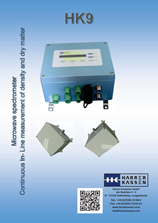 The microwave measurement generate an electromagnetic wave of low energy. This signal is coupled via an antenna into the product (Paper, Tobacco, Sand, etc.). Depending on the dielectric properties of the product the signal propagates in the product. 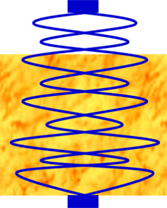 After the signal has passed the product a second antenna receives the signal (Transmission). Amplitude and phase shift of the received signal are an expression for the water content or dry matter of the product. 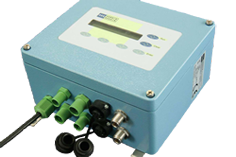 The microwave measurement is very stable and it has a quick response to product changes. The calibration of the HK9 is done with our easy to use Specter9 software.